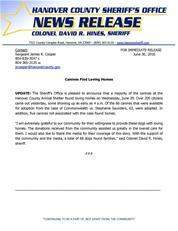 UPDATE: The Sheriff’s Office is pleased to announce that a majority of the canines at the Hanover County Animal Shelter found loving homes on Wednesday, June 29. Over 200 citizens came out yesterday, some showing up as early as 4 a.m. Of the 66 canines that were available for adoption from the case of Commonwealth vs. Stephanie Saunders, 63, were adopted. In addition, five canines not associated with this case found homes. “I am extremely grateful to our community for their willingness to provide these dogs with loving homes. The donations received from the community assisted us greatly in the overall care for them. I would also like to thank the media for their coverage of this story. With the support of the community and the media, a total of 68 dogs found families,” said Colonel David R. Hines, sheriff. •	Driver’s license or other issued form of identification. •	Not banned from future adoptions as a result of the court order. •	Pay an adoption fee of $25.00. •	Sign and agree to have the animal sterilized, rabies vaccinated, and licensed within 30 days post adoption. •	Live within the greater Richmond area. •	If you rent, have a signed and dated letter from your landlord/property owner or a copy of your lease stating you’re allowed to own an animal. •	Only one animal will be adopted per household. No exceptions. All animals are available for adoption on a first come, first served basis. Citizens are encouraged to have their documentation ready as to streamline the process. We kindly remind citizens that all animals currently in the Hanover County Animal Shelter are in need of a loving home.